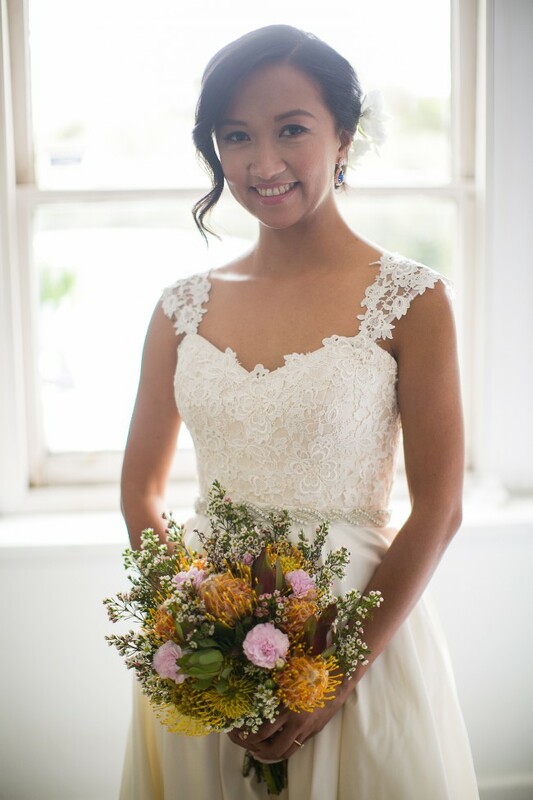 This beautiful dress is from Australian label Caleche, an elegant full silk wedding dress featuring an appliquéd Guipure lace bodice and a contrast tone silk skirt with matching Guipure lace cap sleeves. A classic silk and lace wedding dress with flexible / removable straps. I absolutely love this dress as it's very light and very comfortable and just made me feel so beautiful on my wedding day. The cut just flatters my body shape. The simplicity of the dress would suit brides whose taste gears more towards the classic and timelessness. I bought this from Rafaelle Ciuca in Melbourne and had it altered to suit my measurements. I normally wear street sizes 6-8. I am 160cm tall and wore it with 2" heels, waist: 28", bust: 34". I added a beaded belt as shown in the photo for some accent. The dress has been dry cleaned and pressed but there is a small stain left on the hem which is negligible. If you are shorter than me, you can easily shorten the length. Once you send a message, Cheryl can invite you to purchase the dress.